That's right: TGI... Monday! Thanks to this ingenious idea by Anuradha from Baker Street, we now have every reason to celebrate the ever-dreaded Monday. A little over two months ago, Anuradha created Muffin Monday: a weekly event where a group of food bloggers are given the same muffin recipe to adapt however they choose. On Monday, the muffins are revealed, eaten, and thus, our first day back at work becomes much easier to swallow... so to speak. Given that I still feel like a newbie on the food blogging scene, I was really surprised when Anuradha asked me to join in for this week's Muffin Monday event. Some of my blogger friends have been involved in the past, but they are real, established cooks and bakers! Needless to say, I felt very honoured to be involved in this clever and tasty project. Our muffin mission this week was to bake Doughnut Muffins. It just so happens that these were some of my favourite treats growing up, and I have vivid, wonderful memories of eating my mom's version of this recipe. Despite her penchant for baking, my mom always tried her best to put healthy food on the table when my brother and I were small, so when the smell of these these classic muffins came wafting through the house, it was always the most pleasant of surprises. Because she and my dad didn't overload us with sugar, we always really appreciated the treats when they came. And what's not to love about these petite mouthfuls? Moist on the inside, buttery and sugar-coated on the outside, and ready to eat just minutes out of the oven. So simple, but just so pleasing. The warmth of home and hearth represented in one little muffin. Because of the timeline for this assignment, I realized that F. and I really didn't need any more baked goods in the house, nor would we really be home to eat them, thank goodness. As a result, I decided to call Adsum House - a women's shelter here in Halifax who does incredible, admirable work in our community - to see if they accepted personal food donations. I thought it would be a nice way to kick off the weekend and pass along a treat, rather than be wasteful or over-indulgent. Once I learned they were very much open to this kind of donation, I then needed to double or triple the recipe in order to have enough for all the residents. This is what then prompted me to venture out and play with the recipe a bit, though with varying degrees of success! I decided to try and re-create two of my favourite doughnuts from childhood, from the Canadian chain Tim Hortons: the Boston Cream and the Vanilla Dip. This resulted in what looked more like cupcakes than muffins, but it was a fun process trying to re-create them. I even invited my mom over to bake alongside me, since it was she who first introduced me to these baked goodies in the first place, and its something we haven't done together in ages. Three batches and three styles of doughnuts later, here were my (visual) results. Mom begins her new career as a hand model! Dipping the original recipe in the butter, sugar and cinnamon mixture. The original recipe, and by far the best. Sometimes sticking to the basics is better than trying to get fancy! 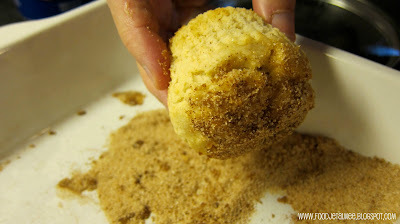 In a large bowl, combine flour, baking powder, salt, nutmeg and cinnamon. 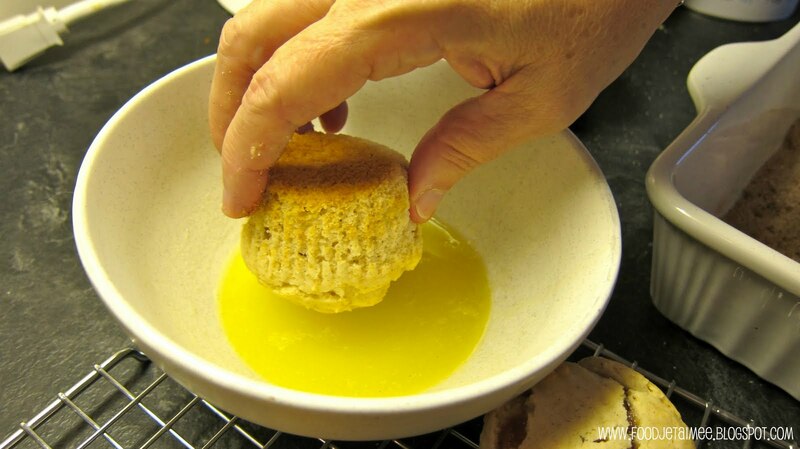 In a small bowl, combine sugar, oil, egg and milk; stir into dry ingredients just until moistened. Fill cups half full; place 1 teaspoon jam on top. Cover jam with enough batter to fill muffin cups three-fourths full. Place melted butter in a small bowl; combine sugar and cinnamon in another bowl. 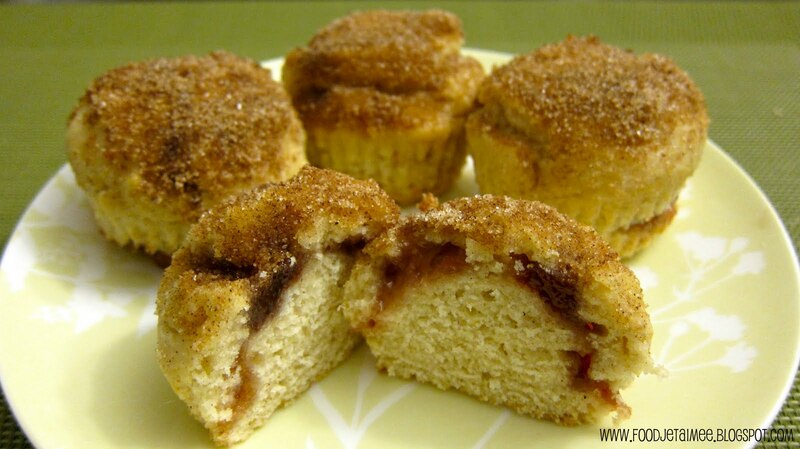 Immediately after removing muffins from the oven, dip tops in butter, then in cinnamon-sugar. Serve warm. For my 'Boston Cream' variety, I mixed some crème anglaise for the center, and topped the muffins with melted baker's chocolate. The result was a dense muffin - the crème having thinned out and fled for the sides - and a not-so-tasty topping. If I were to do this again, I might use a milk chocolate topping, and add a thicker kind of cream to the center, so that it stays put. As for the Vanilla Dips, they were simply topped with vanilla icing and rolled in sprinkles. Pretty tasty, actually, but definitely more of a cupcake than a muffin. Hmm: how to bridge the divide when making doughnut muffins? As said, sometimes sticking to the basics is the best way to go. The original recipe was by far the best. My Doughnut Muffins' last glamour shot. Don't mind the messy muffin cups! oh wow, you did such an amazing job with these!!!!! such great variety!!! love it! happy muffin monday! Well, Well, Welcome to Muffin Mondays! Great to have you along :-) Boston Cream is my fave, too. You just get cooler by the week...lol. I think for those, piping the custard into the middle after baking may be the trick. They may be too dense, but I'm gonna try it ;) Great Job! What a lovely idea to share your Muffins with the shelter. And yours are just fantastic. I love those sprinkles! 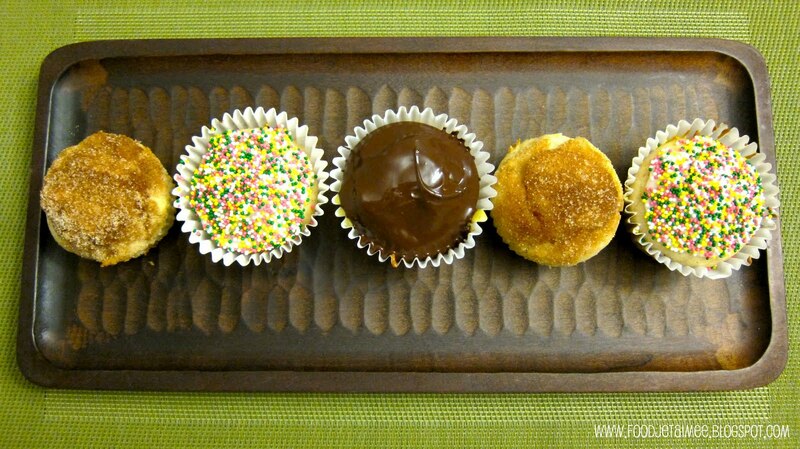 Makes me want to grab one right now:) It was fun baking alongside you and the rest of the Muffin Monday Bakers! 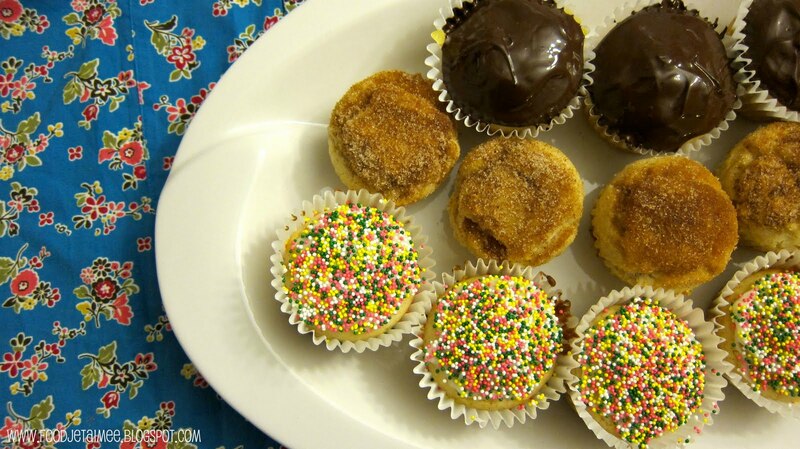 Great job on your muffins, we had similar ideas but I love your idea for Boston Cream, something to try when I bake these again. Kudos for donating them to charity, too. Welcome. what a great idea donating the muffins! i had the same thought when I was baking these this week thinking I really don't need more baked goods in the house, next week I'll take your lead and see if I can also give back with some muffins! love the Boston Cream so creative! Great post and welcome to Muffin Mondays! Happy to have (virtually) baked with you this week :) Perhaps for the Boston Cream muffins you could try filling them after they baked? Similar to cupcakes? Just a thought! An., I have definitely been bitten by the baking bug! I love the way that baking is challenging me to be more organized and precise. The payoffs at the end aren't much to complain about, either ;) Count me in! What an awesome idea to donate these muffins to the Women's Shelter! I love that and I'm sure they were really grateful for such a yummy treat. Your muffins look beautiful and so tasty! Aimee, I could not look at the other Doughnut Muffins until I have posted mine. When I think doughnuts, I think variety, too! Thanks for joining Muffin Monday!